Most people are not aware that the term "Pit Bull" is used to describe a type of dog, not a breed. The term, "Pit Bull" is used to describe dogs such as the American Pit Bull Terrier, American Staffordshire Terriers, Staffordshire Bull Terrier and a few others. Not too long ago, Pit Bulls where considered "America's dog". In the popular movie "Little Rascals", Petey the Pit Bull stole the hearts of fans all over America. Helen Keller had a trusty Pit Bull, "Sir Thomas", always by her side. Historically, Pit Bulls have been loved and adored in our society. Over the past few years, however, Pit Bulls have unfortunately obtained a bad reputation due to aggressive training by some malicious Pit Bull owners. Many are lead to assume that Pit Bulls are naturally mean and aggressive. On the contrary, Pit Bulls have amazing qualities that make them outstanding pets and a great breed overall. Baby & Buddy Animal Rescue encourages you to educate yourself further about this bread. If you are interested in learning more about the Pit Bull breed, contact Baby & Buddy Animal Rescue. Also, check out our lovable Pit, Dudley. Pit Bulls are extremely loyal dogs with great physical and mental characteristics that make them amazing pets. These traits can also hurt the breed as they can make them difficult to handle for people who don't understand the breed or don't have much experience with dogs. Luckily, Pit Bulls are known to be very trainable and eager to please. If properly cared for, trained, and most importantly loved, this breed can make outstanding pets. Pit Bulls are quite adaptable and can do well in various environments -including apartments- given they get enough exercise. Many Pit Bulls are rather easy going, but, like any breed, these guys can be rambunctious as a puppy. 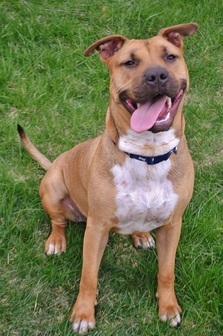 Different from other breeds, Pit Bulls do not fully mature till 2-3 years of age. Pit Bulls are very strong, powerful dogs, and, like any other breed, if they are mistreated, abused, badly bred, or not socialized they can develop behavior problems. The American Temperament Test Society provides temperament tests for dogs around the country. They provide a passing score for the entire breed, based on the percentage of passed over failed within total number of that particular breed tested. As of February 14, 2013, Pit Bulls have a passing rate of 86.8%. Kids and Pits: Children and dogs are always a great combination. However, there are factors to consider when it comes to Pits. While Pit Bulls are generally friendly and sweet, they are strong dogs and they could easily knock over a child by accident. Children should not walk Pit Bulls without an adult assistant, as they are strong, powerful dogs. Socialization: Socializing your Pit Bull is a HUGE part of Pit Bull ownership. If you are adopting a bully breed puppy we strongly recommend enrolling them in a puppy training course. We also recommend going to dog parks and meeting lots of people at a young age, as this can help your Pit as they grow up. Once your Pit Bull grows older, we recommend continuing to socialize them, but keeping the socialization in a safe and controlled environment. Pit Bulls and Other Pets: Pits can do great in a home with another dog. As with all dogs, we recommend that you always separate both dogs when you leave the house and monitor them when they are together.